Our little Gus if from a rescued litter of puppies. 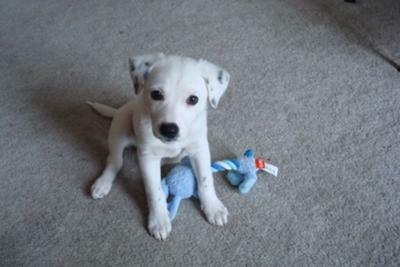 His mom was 100% Jack Russell, and they think his dad was Australian Shepherd. He was born on November 7th, 2008 and came home with us on December 19th, 2008. Gus loves to do tricks (for treats, of course), and he most always has to sit right next to us or directly on one of our laps when he chews on his toys. We think he is THE cutest puppy in the world, and we could not be more in love with him!! !